Gimpel Fils is delighted to announce an exhibition of sculpture, drawings and prints by the French-American artist Niki de Saint Phalle. Including works from the 1960s through the 1990s, this exhibition is a celebration not only of de Saint Phalle’s extraordinary career, but also her relationship with the gallery. 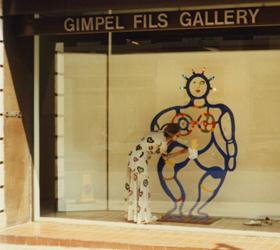 Gimpel Fils first started working with Niki de Saint Phalle in 1979. This mini-retrospective, the gallery’s sixth exhibition of her work, will be at Gimpel Fils through 19 November. See a gallery of works in the Gimpel Fils exhibition.